Bridlemile Creek Stewards Co-Founder Steve Mullinax describes fellow BCS Co-Founder Greg Schifsky, who died in 2017, as a champion of restoration efforts in the Bridlemile community. 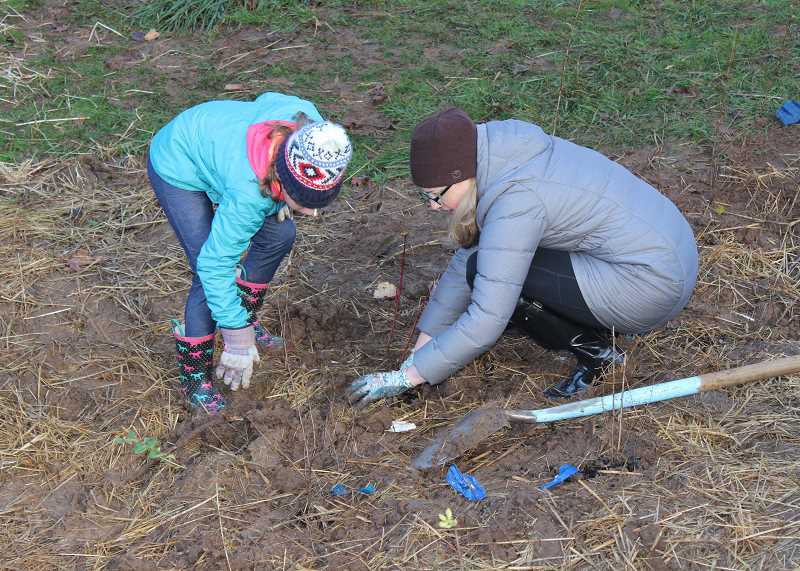 So to honor Schifsky's legacy and to build off of a recent daylighting project, the Bridlemile community and Portland Parks and Recreation collaborated for a native planting event at Albert Kelly Park Saturday, Nov. 18. "Greg had a love of trees and plants. He was a landscaper by trade, and he really wanted to see trees preserved and new trees put in," Mullinax said. "He took the creek stewards on as a labor of love. It was something he did to get to know his neighbors better and do the community and environment some benefit." Before he passed away, Schifsky catalyzed creek restoraton projects at local areas such as Albert Kelly Park and Hamilton Park and also helped homeowners remove non-native species from their property to create healthy, habitable environments. "He was a champion for getting people out and saying, 'This is important. Let's get our hands dirty. Let's manage weeds.' He and Steve Mullinax and all the other creek stewards work really hard and are very passionate about restoring public and private property and restorations on different parts of the creek," said Janelle St. Pierre, a natural resource ecologist with Portland Parks and Recreation. A recent rennovation at Albert Kelly Park and Restoration Creek would have been right up Schifsky's alley. 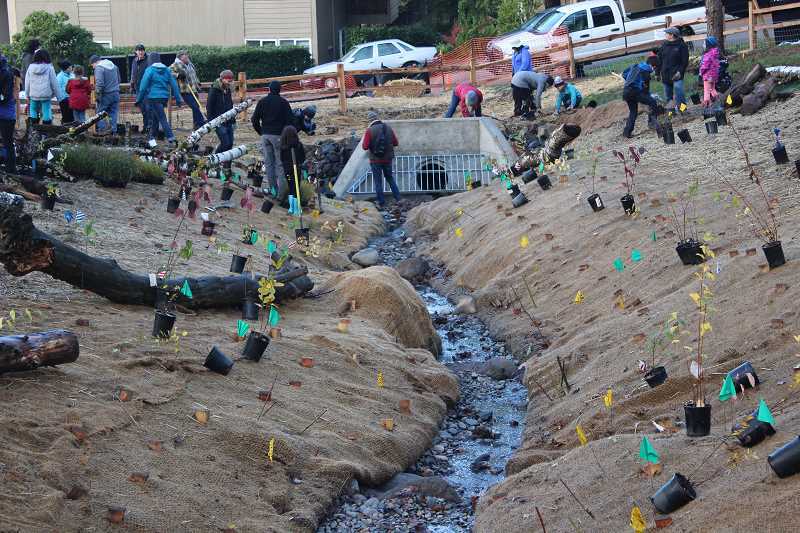 The Restoration Creek Daylighting Project, which was completed this summer, removed a pipe in the southwest portion of the park and replaced it with a streambed. The area was previously filled with grass and mud, but now includes a stream, riparian fencing and a stepping-stone crossing. The switch from a pipe to a streambed was intended to slow down the flow of water and bring it to the surface. St. Pierre and Becky Tillson, an environmental program coordinator for the Portland Bureau of Environmental Services, say the change has ample residual benefits, including boosting water quality. "When the water is moving really fast, it can carry a lot of sediments and pollutants in it. But when it hits a lake or a puddle and when it has a chance to slow down, the water can't hold the sediments anymore so they drop down to the bottom," Tillson said. "So when you have water that's able to move a little bit slower and pond for a second before flowing downstream, it actually has some water quality benefits in terms of cleaning the water." Restoration Creek is also attached to Fanno Creek, which flows into the Tualatin River and the Willamette River. Tillson said that when the water flowing into Fanno Creek matriculates more slowly, flooding events are less likely to occur. Similar projects across the city could further reduce flooding, she said. In 2003, the Bridlemile Creek Stewards removed non-native species along the upper portion of Restoration Creek. The native planting event this November was an extension of those efforts. Attendees planted red osier dogwood, mock orange, ninebark and other plants. Tillson said the streambed restoration and planting will foster a more vibrant habitat. "There's not fish here as far as I know, but there's all sorts of little critters that live in the riparian area — lots of birds, there's a bunch of lady bugs on that tree and other sorts of pollinators really appreciate having the wet, riparian habitat," Tillson said. The stepping-stone crossing was designed so that park-goers can interact with the stream and its habitat. "The other thing we wanted to do was create the crossing so that people could actually experience the creek and step across the creek. This is a really wet park and really slippery, so ultimately we wanted to create a trail that is more sustainable," St. Pierre said. Some citizens involved with the project were concerned that the crossing doesn't provide wheelchair access and could be unsafe for children, but Mullinax is satisfied with the pathway. "I had never heard of building across this way, and ultimately I like the idea," he said. "We got a group of 10-to-12 neighbors together, some with kids. There was a concern it might be risky for kids, but the parents of young children said they loved the idea. They loved the idea of kids being in and around the water." Dozens of adults and children showed up for the Saturday-morning planting. "This is really amazing to see all these people out here and all these people who live here who're going to get to watch all these plants grow. I'm very grateful that everyone showed up for this," Tillson said. Holly Pruett moved to Southwest Portland in part due to the area's abundant natural environment. When she heard about the work the Bridlemile Creek Stewards had done to bolster natural areas, she knew she wanted to get involved. 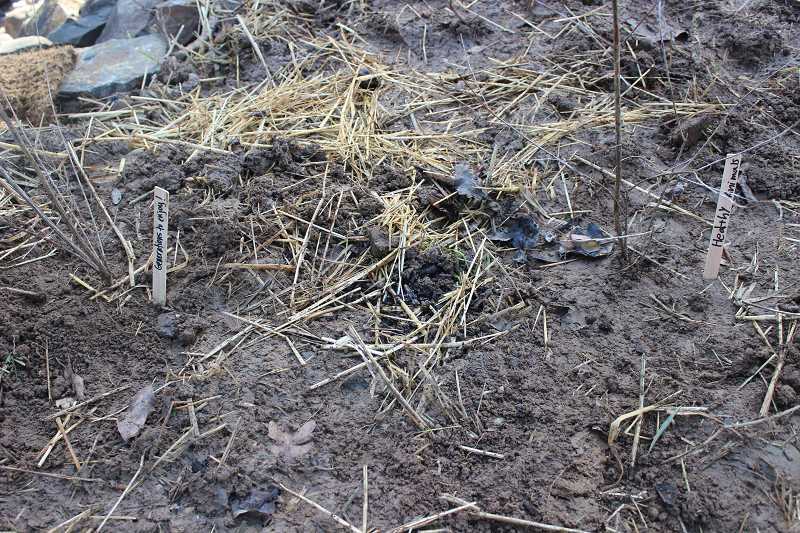 Pruett thought of the idea of giving attendees planting sticks to place into the ground near the stream that include written notes of dedication. Examples include "I love bees," "I love plants" and dedications to Schifsky. "I help families with memorials and funerals and ceremonies of remembrance, and so I thought on a community level that maybe we could all think about a dedication of our work; whether it's to the future of the creek or a healthy watershed or the people that inspire those who are coming to plant to be a part of community and ecosystem stewardship," Pruett said. Pruett said in the current era of smartphones, urbanization and increasing traffic, cherishing the environment is more important than ever. "It's so important to restore our sense of the world as a place of beauty and we humans are just one part of the whole living community. Our parks and our watersheds allow us to do that," she said. As for the newly grounded plants, St. Pierre is excited to see them blossom. "When it blooms," she said, "it's going to be beautiful."